A Jewish recipy book in exile. Our object is a German-Jewish recipe book, which in the 1880s travelled from Prussia to Berlin, in 1937 from Berlin to Lahore, and in 1954 from Lahore to London. The recipes tell us that, and how, its different owners adapted to their new circumstances through setting the table with foreign culinary traditions. Johanna Oettinger, née Lewinsohn (1840-1914) started the collection. That was after she migrated to Berlin with her husband Louis, a well-to-do factory owner. Secular and in part descending from a line of converted Jews, Johanna and Louis nursed a deep pride in their Prussian descent and grasp of German culture. They also loved to serve and taste the world at large in the confines of their own dining room, and oncethey fled the stifling and discriminatory atmosphere of their hometown Marienwerder, French, Italian and Austrian dishes started to adorn their table. After Johanna died, her daughter-in-law Emilia (1876-1954) continued to collect new recipes and also used the booklet to teach her daughters Lisa (1908-2006) and Suse (1910-2005) how to cook. Hers was a modern family, given to sun bathing, hikes, biodynamic principles, and experiments with foreign religions. In 1930, they joined the Muslim-German Society in Berlin: mother Emilia as a founding member, Suse as supporter, Lisa as convert to Islam. In doing so, they joined a glamorous community of upper class Indians and German bohemians, and their future seemed to take a cosmopolitan turn. But after the Nazis came to power, the family once again experienced serious discrimination. In 1937, being engaged to the Imam of the Muslim community without a chance of obtaining permission for their marriage, the couple left for Lahore in British India, determined to send for the rest of the family as soon as they’d settle in. Amongst other things, Lisa took the recipe book with her. Offering 115 recipes in four different handwritings, the Oettinger collection draws a wide historical and geographical culinary arch, from 1880 Marienwerder to fin-de-siècle Berlin, from Nazi Germany to war-time Lahore, and on to post-colonial England of the 1950s. It is an object that was displaced several times, transferring tested culinary treasures to new migratory stations, and continuously adopting new food traditions. In the following, the reader will be made familiar with some of the entries. However, to appreciate their daring outreach more fully, we must first place them against the horizon of traditional Prussian cooking. Two collections illustrate what that kitchen was like. 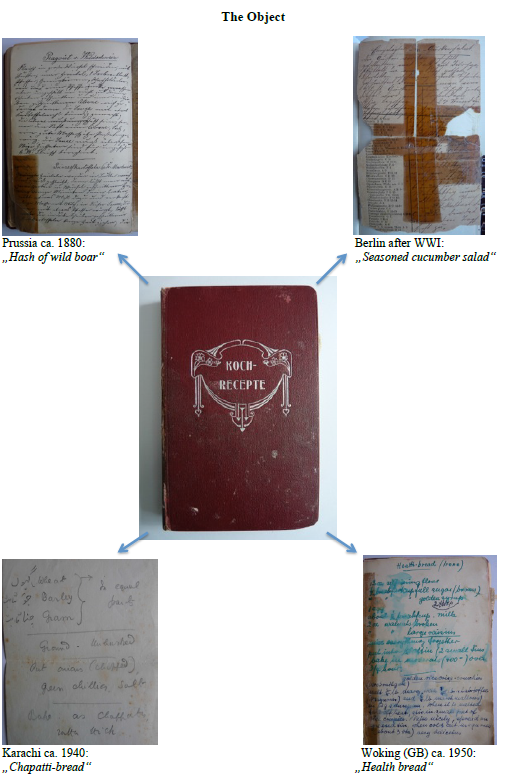 The first is the exercise book of a Prussian schoolgirl, dated 1916. In the lined space on the cover, under the picture of the Kaiser and his wife, the girl entered her name and address: “Bronislawa Lorentz, Hegners Hotel, Marienwerder”, thereby introducing herself as the daughter of the local hotelier in the very Prussian town from which Johanna and Louis Oettinger originated. Written in a clear hand, the 30 lined pages offer a choice of local recipes, four of them on a page, 120 in all. Between them, they offer an elegant solution to deal with food scarcity due to the Great War, and instructions are short and to the point. To quote the first page only, which offers entries for table onions, omelette, ‘poor night’ and biscuit pudding, we read under ‘poor night’: “Carefully stir toast in milk and sugar, cover with egg yolk and bread crumbs, fry brown in hot butter. Serve hot with cinnamon and apple sauce”. Against this horizon of real or imagined local food tradition, the recipes that were collected by three generations of Oettinger women reach out far into the culinary world beyond, and they do not shun complicated instructions to serve that world hot on the plate. Whatever advice Johanna and her granddaughters followed, it was neither Prussian nor Kashruth, the kosher Jewish kitchen that forbids to combine meat with milk, or to prepare pork or crab. Johanna inked in her spidery Sutherlin script a selection of recipes that were neither Prussian nor Jewish: “Spaghetti with tomato sauce (Italian style)”, “Hash of wild boar”; and “Goose-liver pate”. Round children’s letters reveal the secrets of a variety of European sweets such as “Hungarian cake”, “Truffles” and “Bitter orange marmalade”, “Waffles”, “Sugared chestnut” and “Marzipan macaroons”. proper to exchange, made their entry. Names of spenders were always carefully noted down. Whoever the women were who lent the Oettinger women their kitchen secrets, their mention point to an ever-increasing global network. Whereas Johanna still exchanged with cousin Ida Prinz and sister-in-law Ulrike Oettinger, both of who continued to live in Marienwerder, Lisa looked over the shoulders of her husband’s sisters, the ladies Mirza, Baksch and Ahmad in Lahore. Due to the increasing flow of exiles from war-ridden Europe, German women joined their ranks, a Mrs Pollack, a Mrs Rissik, and Fatima Kheiri, former Berlin revolutionary, now German lecturer at Aligarh University. – Dreher, Sybille. Rezepte aus Westpreussen. Kremkau: Helmut-Block-Verlag, 1994. – Lorenz, Bronislawa. Diarium. Marienwerder: Hegners Hotel, 1916 (handwritten manuscript). – Oettinger, Johanna, Emilia, Lisa and Suse. Koch-Rezepte. Berlin – Lahore – Woking, 1880 –1960 (handwritten manuscript).